One hundred years ago. 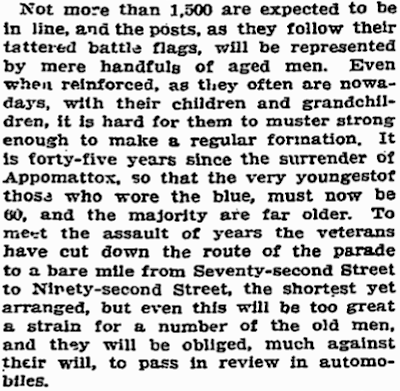 From “Taft Coming Here for Memorial Day; Parade of Regulars, Guardsmen and War Veterans Will Pass in Review Before Him,” New York Times, May 29, 1910. When health advocates first petitioned the federal government to regulate salt in 1978, food companies sponsored research aimed at casting doubt on the link between salt and hypertension. Two decades later, when federal officials tried to cut the salt in products labeled “healthy,” companies argued that foods already low in sugar and fat would not sell with less salt. See? It’s our fault. It’s as if cigarette companies were to blame smokers for the virtually intractable nature of the appetite for nicotine. But an intractable appetite needn’t be forever. Once one gets some distance from processed foods, Cheez-Its and Wheat-Thins and all the rest taste too dang salty. Homemade pita chips are much better (cheaper too). And did you know that Alton Brown is shilling for salt? “It’s the finest compound to ever grace our palates,” says he. Yes, and more doctors smoke Camels. The entire impulse behind Amazon’s Kindle and Apple’s iBooks assumes that you cannot read a book unless you own it first — and only you can read it unless you want to pass on your device. 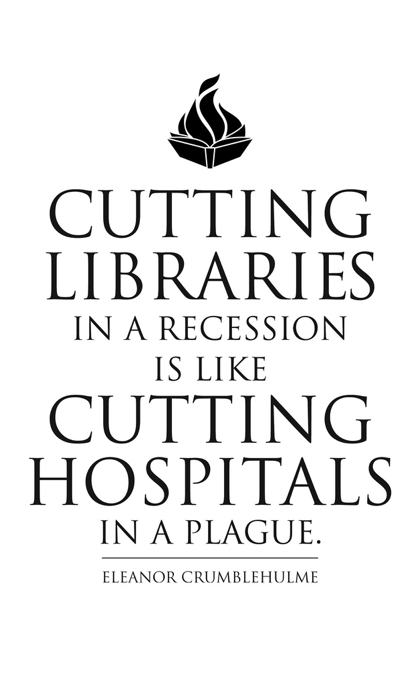 That goes against the social value of reading, the collective knowledge and collaborative discourse that comes from access to shared libraries. That is not a good thing for readers, authors, publishers or our culture. Good news from Music Clip of the Day: Van Dyke Parks can be heard tomorrow on WFMU-FM, performing at Barcelona’s Primavera Sound Festival. “Tune in” (online) at at 7:25 PM (EDT) tomorrow night. Brooklyn is not expanding. But Manhattan is, at least on paper. And Staten Island is shrinking. Look. See? It turned out that there was something terribly stressful about visual telephone interfaces that hadn’t been stressful at all about voice‐only interfaces. Videophone consumers seemed suddenly to realize that they’d been subject to an insidious but wholly marvelous delusion about conventional voice‐only telephony. They’d never noticed it before, the delusion — it’s like it was so emotionally complex that it could be countenanced only in the context of its loss. Good old traditional audio‐only phone conversations allowed you to presume that the person on the other end was paying complete attention to you while also permitting you not to have to pay anything even close to complete attention to her. A traditional aural‐only conversation — utilizing a hand‐held phone whose earpiece contained only 6 little pinholes but whose mouthpiece (rather significantly, it later seemed) contained (6²) or 36 little pinholes — let you enter a kind of highway-hypnotic semi‐attentive fugue: while conversing, you could look around the room, doodle, fine‐groom, peel tiny bits of dead skin away from your cuticles, compose phone‐pad haiku, stir things on the stove; you could even carry on a whole separate additional sign‐language‐and‐exaggerated‐facial‐expression type of conversation with people right there in the room with you, all while seeming to be right there attending closely to the voice on the phone. And yet — and this was the retrospectively marvelous part — even as you were dividing your attention between the phone call and all sorts of other idle little fuguelike activities, you were somehow never haunted by the suspicion that the person on the other end’s attention might be similarly divided. Fugue goes back to the Latin fuga, flight: “a disturbed state of consciousness in which the one affected seems to perform acts in full awareness but upon recovery cannot recollect the acts performed” (Merriam-Webster OnLine). If you can find a phone with a traditional handset, you’ll find, yes, six and thirty-six holes. 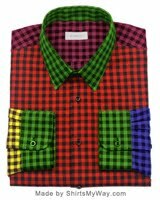 As Cory Doctorow would say: just look at this awesome plaid shirt. Just look at it. It’s the Hatoyama shirt, honoring the Japanese Prime Minister Yukio Hatoyama. And if you’re wondering whether plaid really is warmer than other fabrics: yes, it is. The Deccan College Post Graduate and Research Institute began work on a Sanskrit-to-English dictionary in 1948. The Royal Irish Academy began work on a historical dictionary of the Irish language, Foclóir na Nua-Ghaeilge [Dictionary of Modern Irish], in 1976. Neither project has made it through A (or in Sanskrit, अ). Common threads? Nobody likes Styrofoam. Everybody likes ice. Constructors, especially young constructors, are mostly male. Any thoughts on why? Considering my school and my minor, I suppose I should say something about the phallocentrism of language and the Symbolic Order. Either way, it’s a shame and a trend that I am proud to challenge. The themed answers in this puzzle involve changing Bs to As. For instance, 29-Across, “Monk’s karate blows?”: LAMACHOPS. Smart, funny stuff. 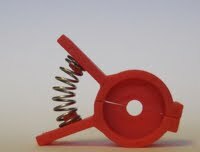 Sitting at my kitchen table yesterday afternoon, I saw this chip-clip as a duck-rabbit. Watching City for Conquest (dir. Anatole Litvak, 1940), I wondered how its contents were ever packed into a 104-minute can. This movie has everything: a scene of the principals’ childhoods in old New York (à la Angels with Dirty Faces), boxing, ballroom dancing, composing, brotherly love, jitterbugs, a swank party, a gangland murder, a symphony at Carnegie Hall, an “Old Timer” (a shabby Everyman-observer), and sardines. And four montages — of New York, Coney Island, dancing, and boxing. Danny Kelly (aka Young Samson) is a reluctant fighter, a former Golden Gloves champ who returns to the ring to help pay his composer-brother Eddie’s tuition. Peggy Nash is a dancer whose rise to success with partner Murray Burns (Anthony Quinn) pulls her away from the city and Danny. Yes, that Anthony Quinn, who turns out to have been a good dancer. (Sheridan’s a good dancer too. 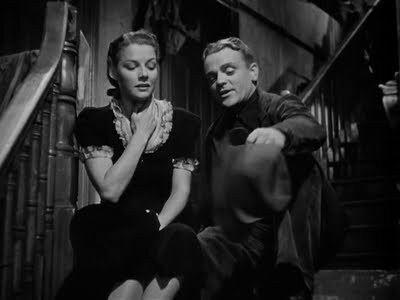 That Cagney barely dances in the film must have amused moviegoers.) Another unexpected element: Elia Kazan as crime boss “Googi,” who at the swank party introduces Eddie as “a composer of real class.” Yes, that Elia Kazan. 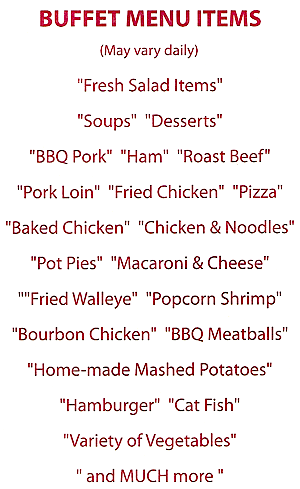 A downstate-Illinois buffet menu. “Cat Fish”: tuna? Academics chose the line “all men by nature desiring to know” but spelt the word “phusei,” “by nature,” with an English S rather than the Greek letter sigma. . . . Professor of Classics Mary Beard, 55, a member of the department, expressed her dissatisfaction in a blog posting about the 5,500sq ft extension which was completed in March. “Even the gods have shown their disapproval in their own inimitable way,” she wrote. I’m reminded of the V8 commercial targeting people who “don’t always like the taste of vegetables.” Grown-ups, eat your spinach! New York Times reporters Corey Kilgannon and Andy Newman accompanied a landlord as he bashed a hole in a door. Behind the door, the room in which pianist Hank Jones lived (when not on the road) in the last year and a half of his life. This shoddy — and perhaps illegal — invasion of privacy has yielded a maudlin, uninformed piece of reportage: A Jazzman’s Final Refuge. If you read it, read too the comments, in which Jones’s manager, family members, and fellow musicians offer their comments on Corey Kilgannon, Andy Newman, and Hank Jones’s life and art. Aaron Cohen poses the question. J.D. 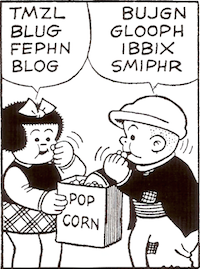 Salinger’s literary agency has already answered: “zoh-ee.” I will continue to think that “zoo-ee” makes better sense. A New York Times slideshow: flight attendant Heather Poole shows how to pack. Blinky, Pinky, Inky, and Clyde: Google today celebrates a thirty-year anniversary. Go to Google and see. Now if only they could fix FeedBurner. It’s available as a PDF from The New Republic (where Wheeler applied for an internship). TNR calls the document “rather remarkable.” No further comment needed. More: The résumé annotated, a PDF from the Harvard Crimson. 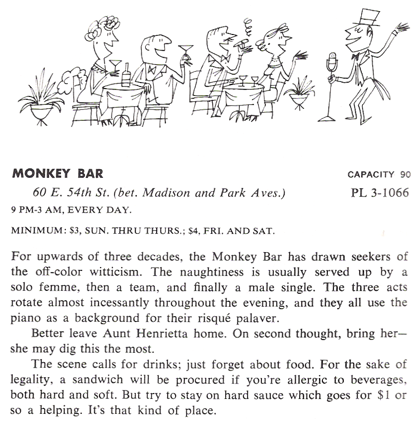 From Harold H. Hart’s Hart’s Guide to New York City (New York: Hart Publishing, 1964). Illustration by Ruby Davidson. “Risqué palaver” and what looks like a three- or four-drink minimum: that must have been quite a scene. I still recall my disillusionment when I visited Apple in 1991 to do a story on John Sculley, who was then the company’s CEO. What I found was an emphasis on computer users as consumers who would buy products they saw on the screen. Of course, from a commercial standpoint, Apple was pursuing what turned out to be a successful strategy. But it’s still one that grates on me. The iPad is the latest iteration of that strategy. Says his lawyer, “He’s never been in trouble before.” But Adam Wheeler is in trouble now. For me, the most remarkable detail in the Adam Wheeler story is his application essay for the Rhodes Scholarship, which plagiarized the work of Stephen Greenblatt. A Harvard English major plagiarizing the work of a Harvard English professor: the plagiarizer’s self-confidence suggests the Dunning-Kruger effect. Then again, Wheeler’s Harvard career seems to have given him good reason to think that he could get away with anything. I suspect a movie in a couple of years. A good title: Veritas. People tend to hold overly favorable views of their abilities in many social and intellectual domains. The authors suggest that this overestimation occurs, in part, because people who are unskilled in these domains suffer a dual burden: Not only do these people reach erroneous conclusions and make unfortunate choices, but their incompetence robs them of the metacognitive ability to realize it. The Dunning-Kruger effect helps to explain why students with serious writing deficits can often have wildly inflated opinions of their abilities (and thus regard as “nitpicky” someone who points out run-on sentences and tangled syntax). Dunning-Kruger also helps to explain why the students who worry most about their competence are usually those with genuinely strong skills. More college-and-iPad news: the Illinois Institute of Technology will be giving iPads to incoming freshmen in Fall 2010. It was the best of times. It was the worst of times. It was a dark and stormy night. It was many and many a year ago, in a kingdom by the sea. It was just one of those things. And thus the years flew by. I have written several five-sentence posts in the past: about clothes, life on the moon, “the ship,” and smoking. And one in the future, about the past. Doers of homework: instead of searching for five sentences, take the time to write sentences of your own. That’s how to learn. The whole area running along the tree‐line and the thickets of like shrubbery and stickery bushes and heaven knew what all was covered with fallen leaves that were dry but had not yet quite all the way lost their color. The leaves were underfoot. Mario kind of tottered from tree to tree, pausing at each tree to rest. It was @ 1900h., not yet true twilight, but the only thing left of the sunset was a snout just over Newton, and the places under long shadows were cold, and a certain kind of melancholy sadness was insinuating itself into the grounds’ light. The staggered lamps by the paths hadn’t come on yet, however. A lovely scent of illegally burned leaves wafting up from East Newton mixed with the foody smells from the ventilator turbines out of the back of the dining hall. Two gulls were in one place in the air over the dumpsters over by the rear parking lot. Leaves crackled underfoot. The sound of Mario walking on dry leaves was like: crackle crackle crackle stop; crackle crackle crackle stop. An Empire Waste Displacement displacement vehicle whistled past overhead, rising in the start of its arc, its one blue alert‐light atwinkle. He was around where the tree‐line bulged herniatically out toward the end of the West Courts’ fencing. The clumsinesses: “whole area,” “heaven knew what all,” “yet, however,” “foody,” “out of the back,” “Displacement displacement,” “around where.” Re: “yet, however”: Wallace likes strings of conjuctions. “And so but,” elsewhere in the novel, is my favorite. Best of all, the strain to be descriptive: the “snout” of the sunset, “staggered lamps,” “crackle crackle crackle stop,” “two gulls in one place,” the “whistling” vehicle, its light “atwinkle.” And that “herniatically” bulging tree-line! Wallace is parodying, of course, writing practices encouraged in workshops across the North American continent. Make the reader feel that bulge! The misused tree-line. A tree-line is not simply a line of trees. The ambiguity of the verb was in the first sentence. If area is the sentence’s subject, then subject and verb agree. If area and thickets (and more?) form a compound subject, was is wrong. The wonderful thing about the sentence is that its clumsiness makes the verb seem wrong, even if it isn’t. “1900h.” Yes, the world runs on military time. The E.W.D. vehicle — one thinks “garbage truck” — whistles past not on a road but in the air. Yes, it’s a different world from the one we’re (still) living in, in which, as Elaine reminds me, there is no East Newton, Massachusetts. [U]nlike his younger brothers Thad, who played trumpet with Count Basie and was later a co-leader of a celebrated big band, and Elvin, an influential drummer who formed a successful combo after six years with John Coltrane’s innovative quartet, Mr. Jones seemed content for many years to keep a low profile. That started changing around the time he turned 60. My dad the tileman (and jazz fan) once did some work in Jones’s northern New Jersey house and got to hear him practice all day. The rear window. The ICE store (bar?). The U CONN DAD and MOM hoodies — when your oldest child is in high school. The cars, facing the wrong way. Either that or the street itself is facing the wrong way. Either that or Connecticut is England. Cat People (dir. Jacques Tourneur, 1942) is a terrifying delight, full of shadows and implications — and a pocket notebook. Irena Dubrovna fears that she is a descendant of her Serbian village’s cat-people and will turn into a panther if stirred by deep passion. Thus she refuses even a kiss from her brand-new, all-American, right-as-rain husband, naval architect Oliver Reed (Kent Smith), who is trying his best to keep this impossible marriage afloat. But it’s complicated: Oliver’s co-worker Alice Moore (Jane Randolph) is deeply in love with him. Irena doesn’t like that at all. Cat People reminds me of Stanley Kubrick’s Killer’s Kiss (1955) and Herk Harvey’s Carnival of Souls (1962), two more low-budget masterpieces that tell their stories with great economy of means and and maximum visual interest. 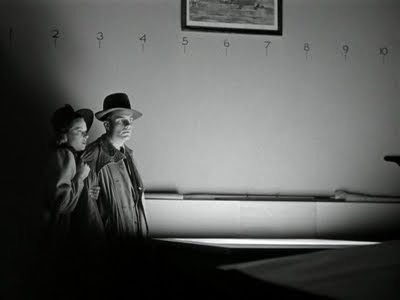 Here’s my favorite shot from Cat People, Alice and Oliver standing by a light table as a panther stalks them in their office. Three cheers for cinematographer Nicholas Musuraca. Because of an editing error, an article last Sunday about GPS driving devices misidentified the country in which the Black Forest is located. The forest, in which the author found the device particularly useful, is in Germany, not Poland. I do like the “tres a ocho años” part (prison!). An agreement between the Chicago History Museum and the Library of Congress will preserve in digital form thousands of hours of interviews that Studs Terkel conducted on Chicago radio station WFMT. He sat on the edge of his bed with his elbows on his knees and scanned the stack of cartridges. Each cartridge in the dock dropped on command and began to engage the drive with an insectile click and whir, and he scanned it. But he was unable to distract himself with the TP because he was unable to stay with any one entertainment cartridge for more than a few seconds. The moment he recognized what exactly was on one cartridge he had a strong anxious feeling that there was something more entertaining on another cartridge and that he was potentially missing it. I have heard young adults describe in similar terms their difficulties in reading a book: giving their attention to one thing means that they will be missing other things. As if one could, yes, have it all — with the exception, I suppose, of that book. Speaking of books — this book, Infinite Jest: I am 100 pages in, or more with endnotes. My readerly intuition was telling me: read Infinite Jest. So I am, twenty-five pages a day. Having taught Charles Dickens’s Bleak House over eight weeks this past semester, I am happily surprised to see that Infinite Jest too seems to be a novel of — to use Dickens’s word — “connexions,” with seemingly unrelated characters beginning to show up in one another’s stories. Do I like Infinite Jest? Oh yes. On sale at the Frank Sinatra website, Capitol Records Concept Albums, a boxed-set of fourteen albums on fourteen CDs, $60, with free shipping. Yes, Capitol has discontinued this set. He was forty-six years old, effortlessly imperial, shyly suspicious, dangerously iconic. With us he was somewhat charming, greeting Betsy warmly, Mosk with a handshake. When he was introduced to me, I threw Arthur at him. “He’s a good friend of mine,” Sinatra said with a strong squeeze of my hand, though my father had met him once and spoken to him on the phone twice about ASCAP business. “Why are there two different versions of ‘To Love and Be Loved’?” is what came out of my mouth. “I don’t know,” Sinatra said, correctly sensing one of the music lunatics. Mosk asked me what that was all about. I told him that I had simply lost it. Jonathan Schwartz, All in Good Time: A Memoir (New York: Random House, 2004). The other players: Betsy Blair, actress; Gene Moskowitz, Variety writer; Nelson Riddle, composer and arranger; Arthur Schwartz, composer. All in Good Time chronicles the ups and downs of Schwartz’s later encounters with Sinatra. Here’s one version of “To Love and Be Loved” (Sammy Cahn–Jimmy Van Heusen). I’m guessing that it’s the one with the high note. A radio station was born from the newly invented Electronic Baby-Sitter, a device that, when placed by a crib, would transmit any disturbance to a radio in another room at 600 on the dial, where there was no New York station. I used the Electronic Baby-Sitter as a microphone, placing it in front of my record player. The result in the living room and in my mother’s room and in my father’s study was nothing short of what my mother called “a miracle.” The music that I was playing in my room was as clear as a chime on every radio in the house. My father’s battery portable, which rested on a bed table by the brown couch, gave me the big idea. I took it, one morning, down the back stairs of the building, all twelve floors, to the street. The reception remained clear as my father changed the recordings in my room. Absolutely clear, even on the street, even across Ninety-fourth and down Lexington toward Ninety-third. I lost the signal a block from home, but it returned and became its powerful self in the lobby of our building. A real opportunity here. A real station, WKCS, in honor of my mother. Jonathan Schwartz, disc jockey, grew up to be Jonathan Schwartz, disc jockey, writer, Sinatra maven. You can still hear Schwartz on the weekends: The Saturday Show and The Sunday Show run from noon to four (Eastern Time) on WNYC-FM, 93.9, streaming at wnyc.org. Some jazz, some pop, some show tunes, some familiar, some rare and out of the way. It’s difficult to stop listening. “We would all have an issue if the dictionary defined a koala as a species of bear, or a rose as a tulip”: physicist Stephen Hughes is asking that the Oxford English Dictionary definition of siphon be changed. It was, in every sense, a diary — a forward-running record, unlike backward-running blogs. The quality of the paper stock, the slot for the pen, the blank but substantial cover, the hints of grand possibilities that came with the inserts — all of these inspired not just introspection but also the joining of history: the mapping of an individual life onto the grand old Gregorian-calendar template. Google Calendar, she says, cannot compare. Quite a few readers argued that the White Pages still serve a useful purpose — other than as doorstops or booster seats — particularly for the elderly, people who live in rural areas and others who have a hard time accessing computers. A bonus: McGeehan’s follow-up has a photograph of a 1951 Manhattan phonebook page with J.D. Salinger’s listing. Exchange name: SAcramento. Do you use any special kind of paper or pencil? I use Blackwing pencils. Blackwings. They don’t make ’em any more, and luckily, I bought a lot of boxes of ’em. They’re very soft lead. They’re not round, so they don’t fall off the table, and they have removable erasers, which unfortunately dry out. Yeah, they’re extinct. Adam Green, Adolph Green’s son, has written an article for The New Yorker, which I think will be published next year. Quite a long article on the Blackwing pencil and the fanatics who go crazy when they don’t have a Blackwing in their hand. You just get habituated. Of course you can still write. If there were no yellow pads in the world, I’d find a way of writing on white paper or on non-lined pads. It’s the lined pads that make it. Yellow is just good because the contrast of the yellow and the black lead is just easier on the eyes than white. If you’ve never seen a Blackwing, here are photographs. 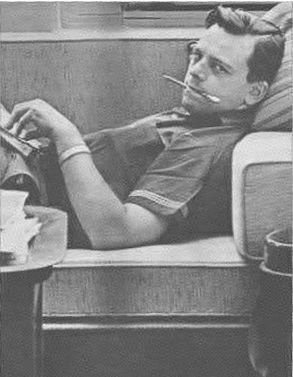 And here is a photograph of Sondheim with a Blackwing. For the Blackwing slogan, stamped into each pencil, see the blog description above. A search for blackwing at the New Yorker shows no trace of Adam Green’s article. I think that this photograph is from Sunset Park, Brooklyn. 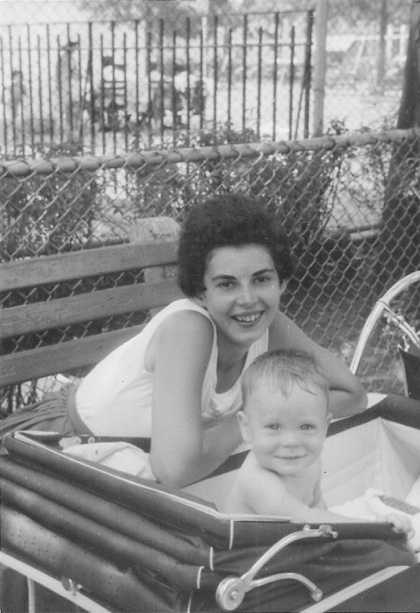 Yes, it’s my mom, Louise Leddy, and me, smiling at my dad. Happy Mother’s Day, Mom. And Happy Mother’s Day to all. When residential directories were delivered this year to the Ivy Tower, an apartment building on West 43rd Street in Manhattan, Ramon Almanzar, a concierge, kept 28 copies in case residents wanted them. Not a single occupant of the 320-unit building claimed one, Mr. Almanzar said. Customers who prefer to look up phone numbers the old-fashioned way or, like Steve Martin’s character in The Jerk, get a thrill from seeing their names in print, would still be able to have the White Pages delivered to them in book form or on compact disc. When it comes to being rude, disrespectful, or abusive to their professors, students appear most likely to take aim at women, the young, and the inexperienced, a new study has found. . . . The study looked beyond the classroom, asking faculty members about their experiences with student incivility in the course of any class-related activities. The types of student incivility it covered included passive behavior, such as sleeping or texting in class; more actively disruptive behavior, such as coming to class late or talking on cellphones in the classroom; and behaviors that appeared directed at the instructor, such as open expressions of anger, impatience, or derision. Betty White hosts Saturday Night Live tomorrow night. But her Golden Girls character Rose Nylund has already hosted Saturday Night Live, sort of. Elaine and I saw a bit of this episode last night and marveled. The Continental Op smokes. Sam Spade smokes. 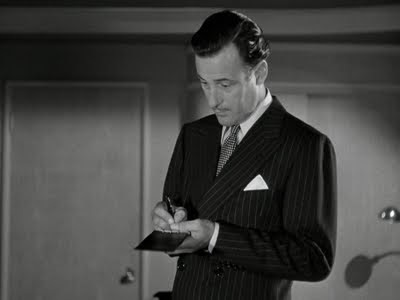 Philip Marlowe smokes. Lew Archer smoked but quit. Thank you, Lew Archer, for not smoking. These five sentences can double as five sentences about private detectives or five sentences about characters created by Dashiell Hammett, Raymond Chandler, and Ross Macdonald (Kenneth Millar). By The Blue Hammer (1976), Archer stopped smoking. Doers of homework: instead of searching for five sentences, just write five sentences of your own. That’s how you learn. It will HAVE a cheezburger. Homer for kids: Rock Odyssey. Telemachus is sixteen years old in this retelling, which would seem to mean that the Trojan War and Odysseus’ wanderings now run for eight (not ten) years apiece — or that while Odysseus is away, Penelope — no, not that. A Google search — poems that dont look like plagiarism — brought a hapless surfer to Orange Crate Art. But I can help, sort of. Here is a poem that doesn’t look like plagiarism. It looks entirely original, like no one else’s poems. That’s because I just wrote it myself, honest. Enjoy. For about a week, I’ve been humming along without caffeine. (See blog description above, at least for today.) I’d say I’m surprised, but in my caffeine-free equanimity, I’m only mildly puzzled. My withdrawal began without intention. For several days, for no particular reason, I was drinking only tea, without my usual cup or two of coffee. (I like tea.) Then I began drinking less tea, more water, just to see how I would feel. (I felt fine.) Then I began drinking one cup of tea with breakfast, and decaffeinated tea and coffee for the rest of the day. After a couple of days, I could feel the unpleasant difference — call it vague anxiety — that the one caffeinated cup was making in my mornings. So I switched to decaffeinated, period. Decaf tea and coffee make me think of filter cigarettes: flavorwise, there’s something missing — not caffeine, but whatever else gets lost in decaffeination. But I suspect that decaf, like soy milk, will soon enough turn into a real thing in its own right. 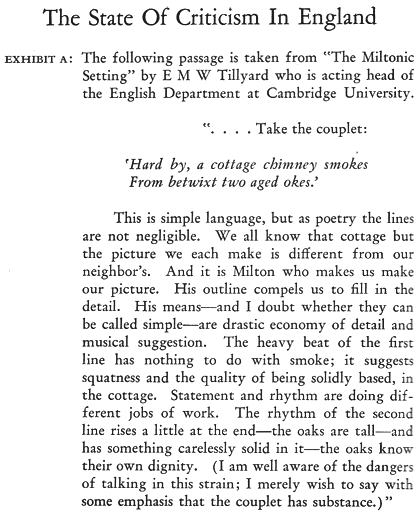 From New Directions in Prose & Poetry, 1938, ed. James Laughlin (Norfolk, CT: New Directions, 1938). This brief passage (concerning lines from John Milton’s L’Allegro) closes the volume; there is no commentary, and no Exhibit B. Anyone tempted to moan about a decline in literary studies might do well to consider what passed for high criticism in 1938. (The Miltonic Setting, Past and Present was published by Cambridge University Press.) A rhythm that is “solidly based” in a cottage? A slight rise in rhythm? 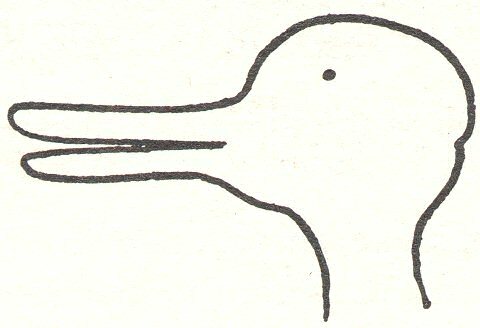 A rhythm that “has something carelessly solid in it”? Say what? Or more formally: Explain?? As for the oaks, I think they lost their dignity by appearing in this bit of exegesis. Tillyard’s bit, I mean; not mine. English majors of a certain age might recall being exposed to Tillyard’s The Elizabethan World Picture (1943). I remember thinking that everyone was walking around with humours and spheres and angelic orders in their heads. Worldviews! Worldviews for sale! The marketing executives are right that audiences will come to see a premium viewing experience they can’t get at home. But they’re betting on the wrong experience. I think the most important thing that we can do is to continue to treat Americans as citizens, not just consumers. If you look out and see an audience of consumers, you want to sell them something. If you look out and see an audience of citizens, you want to share something with them, and there is a difference. Fresh Air has assembled excerpts from several interviews to mark Moyers’s retirement from PBS.